Manila, 26 October 2017 - Representatives of governments attending the year’s foremost wildlife summit have today taken a major step towards agreeing to strengthen measures for the conservation of a wide range of migratory species. 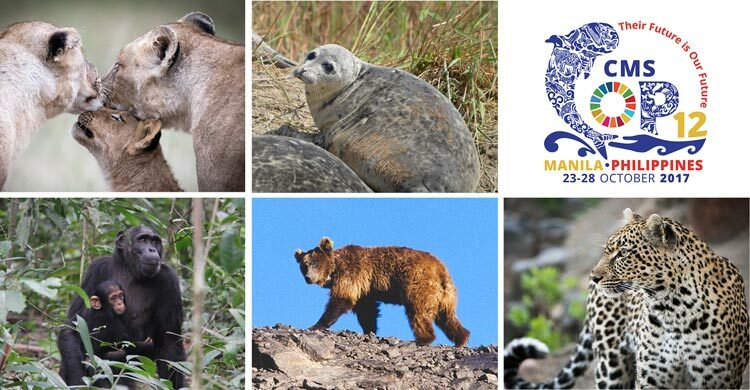 The Conference of the Parties has today given the green light to add a number of endangered animals to the two Appendices of the Convention. Listing on Appendix I requires governments of Parties to protect the species while Appendix II calls for international cooperation to ensure that the conservation status of a species is favourable. The Lion – the King of Beasts’ realm has been reduced dramatically resulting in a reduction of 43 per cent of the species’ numbers globally since 1993. The Leopard – nine sub-species of Leopard occur across Africa and Asia, many of which are undergoing a severe decline in numbers. Appendix II listing as proposed by Ghana, Iran, Kenya and Saudi Arabia might well lead to an informal international initiative to agree and implement targeted conservation measures. The Gobi Bear and the Caspian Seal – possibly only 45 individuals of the Gobi subspecies of the Brown Bear remain in the wild shared between Mongolia and China, while the Caspian Seal is the only marine mammal found in the world’s largest inland sea, where its migration is prompted by ice formation and foraging. Threats to the seals are direct hunting, bycatch and disease, with three mortality events around the turn of the century being attributed to distemper outbreaks. Unusually for CMS, votes were necessary on the proposals regarding the Lion, the Leopard, the Giraffe and the Chimpanzee as it proved imposible for Parties to reach consensus. All four proposals were carried by large majorities. A number of avian species have also been approved for addition to the CMS Appendices. These are the Christmas Frigatebird, a subspecies of the Black Noddy, the Steppe Eagle, the Lappet-faced Vulture as well as nine other species of vulture occurring in Africa and Asia, the Yellow Bunting and the Lesser and Great Grey Shrike. COP11 in Quito in 2014 was dubbed the “Sharks Conference” as Parties agreed to list a number of sawfish and mobular rays to the Appendices. COP12 has agreed to additional protection to further species of fish – listing the Whale Shark already included on Appendix II on Appendix I and adding the Dusky Shark, the Blue Shark, the Angelshark, the Common Guitarfish and the White-spotted Wedgefish to Appendix II. In all a total of 35 species were proposed for inclusion on the CMS Appendices in submissions made by 24 Parties from Asia, Africa, the Americas, Europe and Oceania. The proposals had all been examined by the Sessional Committee of the CMS Scientific Council at its meeting in July 2017. Approval today at the Committee of the Whole clears the way for the proposals' formal adoption by the Conference Plenary session on Friday. The changes will take effect 90 days after the close of the Conference.